Since Smarty is a dreamer, her head is often truly “in the cloud”. Since early childhood, she was very interested in all things space. Here is how we supported this interest over years. Smarty was reading books about space since she was 2. Now she is all about fantasy, but space is an only subject that still pulls her back to non-fiction. Her recent non-fiction space finds include Ken Jennings’ Junior Genius Guide to Outer Space and Ripley’s Shout Outs: Zoom! So far we have only built Lego rockets – Smarty received a Lego shuttle as a present for Christmas one year, and Papa built her this shuttle out of standard Lego bricks to prove a point that it can be done. We still have plans to launch a soda bottle rocket, Alka-Seltzer rocket, and bike-pump rockets. When opportunity presents itself, we go with Smarty on night walks. Most of the nights, our Silicon Valley sky is clear, but light pollution is pretty strong, and we can only see brightest objects in the sky. Alas, none of us is strong is astronomy and star identification, but SkyView app really helps to at least identify major constellations and planets. We also bought a Target telescope for $15 once, but that was a dud. We are still contemplating a better telescope, but, to be honest, Smarty is not really interested in astronomy that way. She is more intrigued by more profound questions – what was there before the Big Bang and why did it happen? Will the universe expand forever? What is dark matter? Will we discover alien life? Those are questions occupying her mind, especially at night. NASA Ames Research Center in Mountain View has a small museum that is open to public. It has an interesting collection of exhibits related to early space exploration and about current robotics program. Our 4 year old mostly enjoyed touching a real moon rock. We stopped in California Science Center on our way from San Diego in 2013, because we all wanted to see Endeavor. It was still in temporary facility and 6 year old Smarty hated the smell of it. She wanted out in 5 minutes, but she enjoyed the permanent space exhibition in the museum and the rest of hands-on exhibits. I am hoping we will come back there when she is older. Smarty, as other young and old space enthusiasts around the globe, is thrilled about New Horizons probe approaching Pluto. Your kids can follow NASA online, read astronomy news, or follow astronomy picture of the day for fascinating pictures of the universe. Do you have space enthusiasts at home? How do you encourage their interest in space? Follow my Astronomy for Kids Pinterest board. 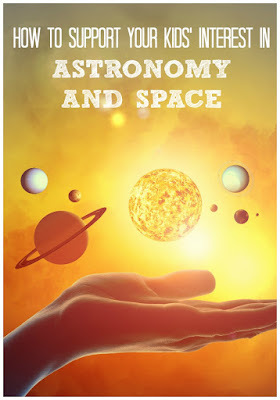 Follow Natalie Planet Smarty Pants's board Astronomy for Kids on Pinterest. We were just reading about it passing Pluto and looking at the picture released. My kids remain shockingly uninterested in space. Mike wanted to be an astronaut, but even I was mildly interested as a kid. Sort of off-topic, but is there a museum in the area that you would consider worth buying a membership for? Preferably one that isn't constantly packed. We were able to attend a couple of different library hosted astronaut presentations when the children were younger. Meeting people who had actually been into space, and hearing about their experiences helped to spark a good deal of interest. I wanted to be an astronaut when I was little. I hope my little ones show an interest in space too! Thanks for your ideas!